Getting the green light for the first time, 2017 Panini Absolute Racing NASCAR applies the known brand to the track with one hit per pack. The total hobby box yield includes a pair of autograph and memorabilia cards. While the details on the base set are minimal, one numbered base parallel falls in each pack. 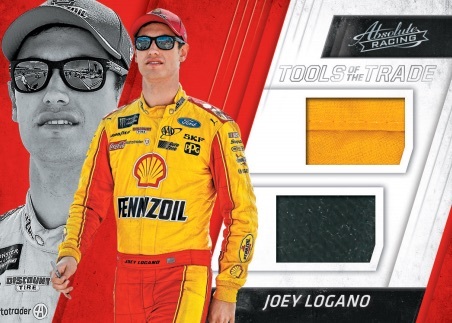 The 2017 Panini Absolute Racing NASCAR checklist also offers a blast from the past with the rounded Action Packed inserts. These add several Spectrum parallels, including Blue (#/199), Red (#/149) and Gold (#/99). Inserts combine to average one per pack. 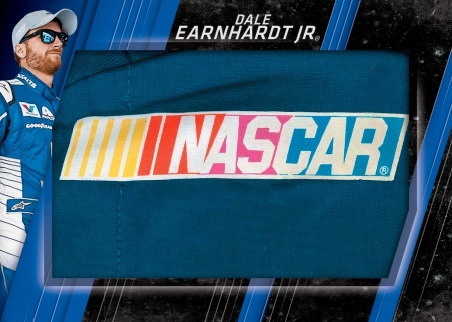 Emphasizing on-card signatures, many of the 2017 Panini Absolute Racing NASCAR cards also have race-used relics. 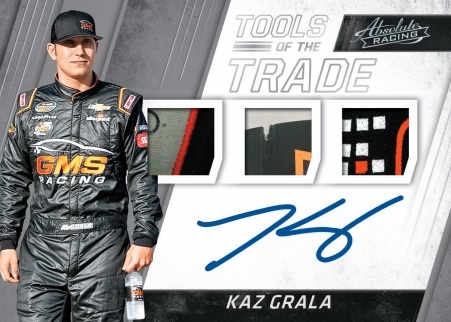 Among the choices are Absolute Memorabilia Signature and Tools of the Trade Trios Signature cards that feature one driver. The Team Tandems Signature set pairs two drivers with a shared history. Each of these auto relics also come with Spectrum Silver (#/99 or less), Blue (#/49 or less), Red (#/25 or less) and Gold (#/10 or less) parallels. On the other hand, Absolute Ink relies solely on the signature. It, too, has Spectrum parallels, with Blue (#/99 or less), Red (#/25 or less) and Gold (#/10 or less). 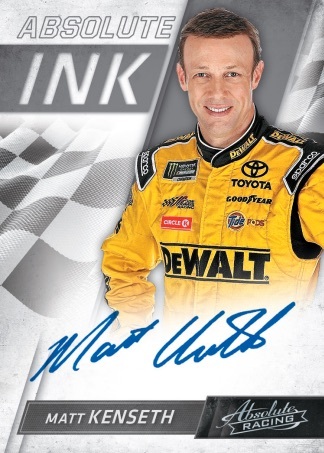 Obviously, 2017 Panini Absolute Racing NASCAR wouldn't be complete with a heavy helping of memorabilia. Absolute Prime jumbo patches, numbered to no more than two copies, present many impressive logo swatches. There are also the popular Tools of the Trade inserts which provide a large assortment of Spectrum parallels. 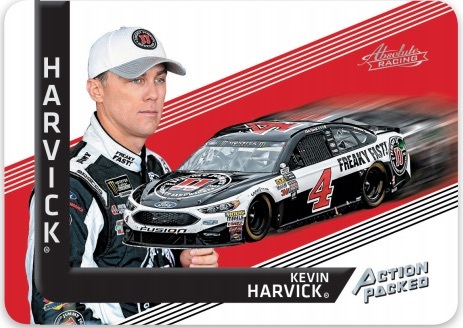 The SRP for 2017 Panini Absolute Racing is $100 per hobby box. Designs and contents subject to change. SPECTRUM PARALLEL CARDS: Silver #/299, Blue #/199, Red #/99, Gold #/25, Printing Plates 1/1. SPECTRUM PARALLEL CARDS: Blue #/99 or less, Red #/25, Gold #/10. SPECTRUM PARALLEL CARDS: Silver #/99 or less (No Austin Dillon, Busch), Blue #/49 or less (No Hamlin), Red #/25 or less, Gold #/10 or 1/1. 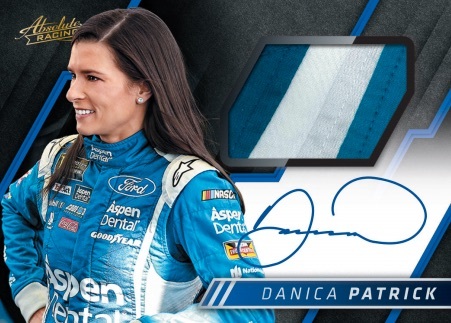 SPECTRUM PARALLEL CARDS: Silver #/99 or less, Blue #/49 or less, Red #/25 (Patrick, Elliott, Burton - #/10; LaJoie, Grala - #/15*), Gold #/10 (Elliott - #/9; Patrick, Burton - #/5*). SPECTRUM PARALLEL CARDS: Blue #/199, Red #/149, Gold #/99. 50 cards. Multiple Associate Sponsor versions exist for each card with up to 10 different versions. 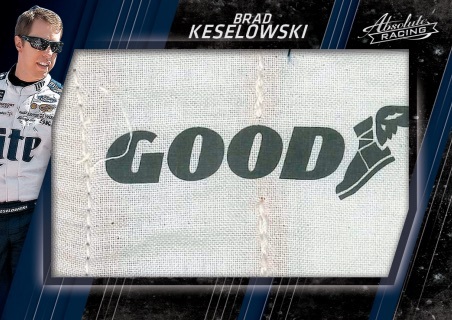 VERSIONS: Goodyear #/2 or 1/1, Nameplates #/2 or 1/1, Associate Sponsors 1/1 (10 versions), Manufacturer 1/1, NASCAR 1/1, Series Sponsor 1/1. All subjects not included in each parallel. View specific options with the spreadsheet. SPECTRUM PARALLEL CARDS: Silver #/99, Blue #/49, Red #/25, Gold #/10. SPECTRUM PARALLEL CARDS: Silver #/50 or less, Blue #/35 or less, Red #/25 or less, Gold #/10 or less. SPECTRUM PARALLEL CARDS: Blue #/49 or less, Red #/25 or #/5, Gold #/10 or 1/1. SPECTRUM PARALLEL CARDS: Silver #/99 or less, Blue #/49 or less, Red #/25 or less, Gold #/10 or less. 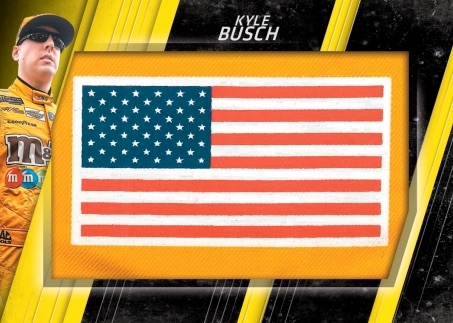 SPECTRUM PARALLEL CARDS: Silver #/99 or less (No Hamlin*), Blue #/49 (Hamlin, Kurt Bush - #/10), Red #/25 (Hamlin, Kurt Busch - #/5), Gold #/10 (Hamlin, Kurt Busch - 1/1). SPECTRUM PARALLEL CARDS: Silver #/75 or less, Blue #/40 or less, Red #/25 or less, Gold #/10 or less.